The global education department kicked off the new school year with a visit from Jin Yanfen, a teacher with a specialty in English as a Second Language from the World Foreign Language Middle School (WFLMS) in Shanghai, China. Jin (who goes by the name Fendy) was the first exchange teacher this school year to visit from WFLMS, Harker’s Chinese sister school. Established in 1996, WFLMS is located in the southwest part of the Xuhui District in Shanghai, an area regarded as an important educational location. 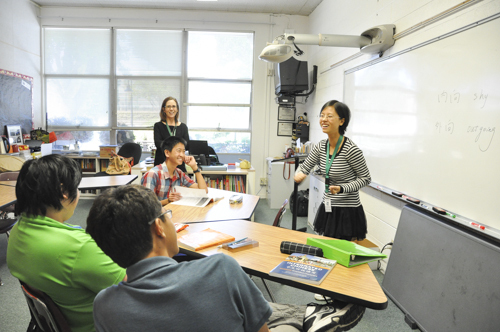 During her recent schoolwide visit, Jin observed and taught classes in both world history and Mandarin at the middle school. She also taught a Mandarin class at the upper school and read a book about Chinese writing to kindergartners at the lower school. Harker’s teacher exchange program is an example of its ongoing effort to build progressive academic and cultural partnerships between institutions around the world, providing meaningful experiences for students at all grade levels and preparing them to be true global citizens. “We (WFLMS and Harker) have known each other for a long time. Our students enjoy the chance to communicate with an English-speaking friend; we especially want to know about America,” said Jin. During her time at Harker, Jin was diligent about introducing information about Chinese culture and its traditional festivals, food and Confucianism so that students could more readily understand it. She also informed both Harker teachers and students alike about how China’s educational system operates. “Our students – at all campuses – really benefit from these exchanges. They always approach me, asking questions about our guests and wanting to find out more about them,” reported Jennifer Walrod, Harker’s director of global education.